Review: "Queensryche: American Soldier" - Sea of Tranquility - The Web Destination for Progressive Music! Anyway, I have given this disc quite a few spins and a fair chance, nothwithstanding my recent disappointment. American Soldier is a concept album attempting to examine war through the eyes of soldiers, and therefore contains myriad spoken passages and voiceovers, perhaps a bit redundantly. A while ago, Geoff Tate gave an interview in which he explained what each song deals with lyrically, so seek it out if you're interested. From a musical standpoint, despite attempting to portray the casualties of war, much of the album stays in mellow territory, straying only in spots with the speeding up of drums and rhythm guitars -- albeit in the most typical ways. Instrumentally, it bears absolutely no similarity to the band up until the mid-90's. The so-called guitar solos on tracks like "Sliver" and "Unafraid" would perhaps help these cuts stand strong, but since they are drenched in endless spoken parts and voiceovers, they fail to impact the listener as much as they should. The bass and riffing on the latter actually shows a glimpse of hope before they get buried in the mix and the saccharine chorus. It is no secret that Geoff Tate is no longer the wailer he used to be 15 years ago, but the reason why this album is so boring and flat is not because of Tate's singing. The man actually now has a very rich low tenor voice which he uses to great effect, singing passionately to aptly deliver the messages. Actually the only thing that connects this band to the Queensryche we know is Tate's voice. He is at his most expressive on "At 30,000 Ft", the dark ballad, which slowly builds up to an interesting instrumental section with wailing guitars and slamming drum workout towards the finale. Unfortunately, Tate's powerful voice is not enough to save the album, as the album contains way too many ballads in the form of "Remember Me" and the absurdly cheesy "Home Again" in which Tate duets with his 10-year-old daughter. Give me a break. The song sounds so tired and the instrumentation so lifeless, not to mention the unbearably melodramatic singing, I still cannot believe they recorded this track. What were they thinking? Of course, the band revisits its past couple of letdowns, incorporating modern beats, watery synth elements into the midtempo cut "A Dead Man's Words", and multi-tracked vocalizations placed atop a lifeless 4/4 beat on "Hundred Mile Stare" (with perhaps the worst ending on the whole disc). And I'm not even describing "The Killer", easily the poppiest chorus Tate has come up with in a decade. The chorus that is draped over the militaristic drumming is abysmal. On a positive note, the production is thick and multi-layered, so listening to the album on head phones will help you discover a lot of elements buried underneath the mix. The use of doubled vocals, weird background chants, interesting drum beats and saxophones on "Middle of Hell", for instance, somewhat keeps the number from being an all-out downer, due to its awfully slow tempo and fizzly guitar chord shimmerings. To their credit, both Geoff Tate and producer Jason Slater have done an okay job. Too bad a good production is not enough when inspired and creative songwriting is not there anymore. With this album, they have added yet another nail to their coffin. When will they finally realize that they are Queensryche in name only? Back in the 80's a band released two fantastic albums that I couldn't get enough of, the two being Rage For Order and Operation Mindcrime, that band of course was Queensryche. As time went on I found myself less drawn to them, with Promised Land being the last album I really liked, Here In The Now Frontier had it's moments but it wasn't the same for me. When Operation Mindcrime 2 was released I was skeptical and quite disappointed on hearing it, as it paled in comparison to the original. To their new album American Soldier, I was torn whether to bother or not, but curiosity got the better of me, maybe that missing vibrant spark had returned? This album is far from their best, but at times like on "Man Down" I hear that old spark and they sound more like the band I was fond of. Shame their isn't much more like this, many tracks I could do without, American Soldier needs a big shot of excitement, especially from a band that used to deliver in spades. Oh, how the mighty have fallen...I'm sure many had high hopes for this latest from Queensryche, another concept album after the somewhat successful Operation Mindcrime II. Though American Soldier was a good idea, seeing as how relevant war is these days, the CD is a miss on so many levels, the dark concept not working as it should due to the fact that the songs here are just not memorable, and the instrumentation really not up to par with what we expect from Queensryche. For starters, there's just way too many voice overs and bits of narration going on here, to the point that it totally detracts from the music, as it does most annoyingly on "Unafraid". Kick of track "Sliver" is a high powered rocker, but thanks to some clearly out of place gang styled raps, forces this song into some late 90's nu-metal/rap-metal time zone. Geoff Tate for the most part is in fine form, his more husky delivery these days is less histrionic than the Tate of days gone by, but the guy can still sing with the best of them, and his strong mid range works quite well on the moody "Hundred Mile Stare" and the brooding "If I Were King". The problem is, his voice just can't save these pedestrian songs, the CD more a collection of ballads and dark, moody rockers, with hardly a catchy hook to be found, and certainly a lack of any memorable riffs or intriguing musical arrangements. On the rare occasion that the band seems somewhat inspired, as they do on "Man Down!" or the somewhat proggy closer "The Voice", it's just not enough to drag the listener from the boredom that the rest of the CD had already induced upon you. The real chore here is feeling that strong sense of loyalty to this band, after all the successes they have had in the past (and some real lows), and wanting, really NEEDING to like American Soldier, but in the end feeling horribly let down and disappointed. Even after many spins, it just doesn't get any better. Like I mentioned, there's a few decent tracks here, certainly not anywhere near 'vintage' Queensryche, but strong tunes nontheless, but as a whole, American Soldier comes across as a real clunker for this once great band. I'm sure the intentions where there, but the end result is just one big missfire. Too bad. After hearing that Queensryche would have a new album out, i was reminded of their earlier music and glad to hear that they were back in the game. I admit, as I listened to American Soldier, i was reminded of Empire, now this was not necessarily a bad thing, it showed that from my perspective the band has stuck to their guns and produced an excellent album. As for the opinion that the quotes were overdone. If they took the time to listen to what Tate has said he was trying to accomplish with this album, maybe they would understand the message. Coming from a family where military service has been an honored profession, and still serving myself I am greatfull for Queensryche's support. You don't have to have served to support the men and women that this album is dedicated to. I do believe this album was made for combat soldiers. We love it. Someone speaking about our fears, pains and losses. No one, and I mean no one, has ever done that in an entire album form. Guess you might have to have been a Warrior to "get" this album. And by the way...the song with his daughter still brings tears to my eyes when I hear it. Of course, I've only been home two months. I think too many of you compare any any QR albums to OMC and Empire. No QR album is good unless it sounds like these two album. If you would take these two out of the equation and compare it to albums from Promise land through OMC II, it is clearly this is the best album they made. How anybody say that these are boring songs. Promise land maybe had 3 heavy soung and rest were laid back. QR has never made the same record twice. They been doing this for 20 or more years. Put away your old QR CDs and focus on the New CD in front of you. It sounds like most you play OMC and Empire right before you listen to american soldier. After hearing "Operation Mindcrime" & "Empire" I heard 1 1/2 tracks in on this album. It left me scratching my head in disbelief. There seemed to be a certain strength lacking that I expected to hear. Much to my surprise I found myself saying I liked "Collision Course" by Royal Hunt 3 times better than this, and this when I was originally first concerned how their new vocalist was going to sound. Honestly I find that the O3 trilogy by Charlie Dominici had greater strengths. Maybe I'm missing something, maybe I need to get a little further into the album, but I have to say that I even found the sound a little thin in places where I felt it should have been meatier, more bass, for example. Maybe I just need to give this another spin. Well, we'll see. I�ve just read this review and i really don get it. I�ve been listening to the album for some time and it�s been growing on me since the first time. It�s has lots and lots of great ideas, it�s very well singed, it�s well played ( i love the drums), it�s complex, sometimes more dark than others, it�s not obvious ( how many bands would risk a song like "unafraid" as track n� 2? So what�s the problem? Either you like the band or not. If the reviewer doesn�t like QR, than they could put out a perfet album that he still wouldn�t like it. Not even the song "killer" is saved. lol. It�s a great song. Maybe not a masterpiece, but it�s in my ear for a week. I just posted because i couldn�t believe while i was reading the review. I know that QR latest albums were badly received but i dont thing that giving bad reviews to a a cd like this just because it�s QR is fair. Forget all the negative reviews on the site. 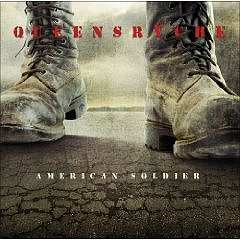 American Soldier is a masterpiece and belongs to the best works of Queensryche so far. It's dark, emotional and Geoff Tate hits the jackpot with this one. It's a great mixture between Empire, Promised Land and a slightly twist of Tribe. Can't wait to see The Ryche back on tour, they are back from the grave!